UN Peacekeeping has a number of magazines that are produced each year. Download the latest below. This review evaluates how the GFP has contributed to joint working arrangements that have produced real outcomes on the ground in post-conflict and crisis situations. Find out more about UN Police. Produced twice a year, find out more about UN Police. A retrospective look at this crucial peacekeeping issue. A look at this crucial peacekeeping issue. The SSR Perspective describes the evolution of the UN Security Sector Reform agenda and showcases activities being undertaken in the field and by the SSR Unit at Headquarters. 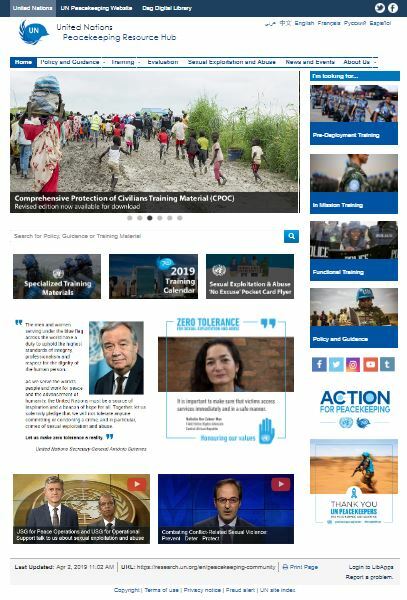 Peacekeeping main annual publication - read about the key events that shaped each year, and gain an insight in to the peacekeeping world. Learn quick facts and the numbers behind UN Peacekeeping Operations. This recent HOW Design Award publication, produced in 2013, showcases the achievements of the United Nations Police Division (UNPOL) over the past five years. An annual look at the work of the United Nations in the corrections area with a focus on our programmes in post-conflict environments. An annual look at the work of the United Nations in the justice area with a focus on our programmes in post-conflict environments. Find out more about the key issues we face in peacekeeping.